Beatrix (Beatrix Wilhelmina Armgard, Dutch pronunciation: [ˈbeːjaːtrɪks ˌʋɪlɦɛlˈminaː ˈʔɑrmɡɑrt] ( listen); born 31 January 1938) is a member of the Dutch royal family who reigned as Queen of the Netherlands from 30 April 1980 until her abdication on 30 April 2013. On Koninginnedag (Queen's Day), 30 April 2013, Beatrix abdicated in favour of her eldest son, Willem-Alexander, and resumed the title of princess. At the time of her abdication at age 75, Beatrix was the oldest reigning monarch in the country's history. Beatrix was born Princess Beatrix Wilhelmina Armgard of the Netherlands, Princess of Orange-Nassau, Princess of Lippe-Biesterfeld, on 31 January 1938 at the Soestdijk Palace in Baarn, Netherlands. She is the first child of Princess Juliana of the Netherlands and German aristocrat Prince Bernhard of Lippe-Biesterfeld. Beatrix was baptized on 12 May 1938 in the Great Church in The Hague. Her five godparents were King Leopold III of Belgium; Princess Alice, Countess of Athlone; Elisabeth, Princess of Erbach-Schönberg; Duke Adolf Friedrich of Mecklenburg; and Countess Allene de Kotzebue. Beatrix's middle names are the first names of her maternal grandmother, the then reigning Queen Wilhelmina, and her paternal grandmother, Armgard of Sierstorpff-Cramm. When Beatrix was one year old, in 1939, her younger sister Princess Irene was born. World War II broke out in the Netherlands on 10 May 1940 (Westfeldzug). On 13 May, the Dutch Royal Family evacuated to London, United Kingdom. One month later, Beatrix went to Ottawa, Ontario, Canada, with her mother Juliana and her sister Irene, while her father Bernhard and maternal grandmother Queen Wilhelmina remained in London. The family lived at the Stornoway residence (now the residence of the Leader of the Opposition in the Parliament of Canada). With bodyguards and ladies in waiting, the family summered at Bigwin Inn on Lake of Bays, Ontario where four private stone cottages of the resort served as their retreat. While on Bigwin Island, the constitution of the Netherlands was stored in the safe of Bigwin Inn's Rotunda building. Princess Juliana and her family were remembered for their "down to earth" friendliness, general gratefulness and great reverence for their homeland and people, to whom they paid homage by refraining from all luxuries offered to guests at the resort that was once billed as the largest and most luxurious summer resort in Canada. In order to provide them with a greater sense of security, culinary chefs and staff catered to personal orders at meal time. Upon their departure, the hotel musicians of the Bigwin Inn Orchestra assembled dockside; and at every public performance afterward through to the end of World War II, the Wilhelmus was played. In the years following the shuttering and neglect of the island resort, the "Juliana" cottages were well maintained and preserved in an informal tribute to Princess Juliana and her family. In thanks for the protection of her and her daughters, Princess Juliana established the custom of the delivery to the Canadian government every spring of tulips, which are the centrepiece of the Canadian Tulip Festival. The second sister of Beatrix, Princess Margriet, was born in Ottawa in 1943. During their exile in Canada, Beatrix attended nursery and Rockcliffe Park Public School, a primary school where she was known as "Trixie Orange". On 5 May 1945, the German troops in the Netherlands surrendered. The family returned to the Netherlands on 2 August 1945. Beatrix went to the progressive primary school De Werkplaats in Bilthoven. Her third sister Princess Christina was born in 1947. 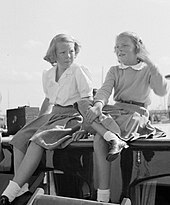 On 6 September 1948, her mother Juliana succeeded her grandmother Wilhelmina as Queen of the Netherlands, and Beatrix became the heiress presumptive to the throne of the Netherlands at the age of ten. In 1954, Princess Beatrix served as bridesmaid at the wedding of Baroness van Randwijck and Mr T Boey. 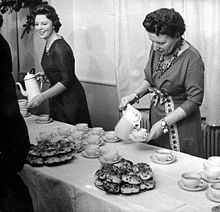 On 31 January 1956 Princess Beatrix celebrated her 18th birthday. From that date, under the Constitution of the Netherlands, she was entitled to assume the Royal Prerogative. At that time, her mother installed her in the Council of State. The princess also visited various European and international organisations in Geneva, Strasbourg, Paris, and Brussels. She was also an active member of the VVSL (Female Union for Students in Leiden), now called L.S.V. Minerva, after merging with the Leidsch Studenten Corps (which before then was male-only). In the summer of 1959, she passed her preliminary examination in law, and she obtained her law degree in July 1961. As monarch, Beatrix had weekly meetings with the prime minister. She signed all new Acts of Parliament and royal decrees, and until a constitutional change late in her reign, appointed the informateur, an official who is responsible for chairing coalition talks in the formation of new governments. At the state opening of parliament each September, she delivered the Speech from the Throne, in which the government announces its plans for the coming parliamentary year. As Queen, she was president of the Council of State. Her role was largely ceremonial and as a focus of national unity; she did not make legislative or executive decisions. Beatrix is a member of the Bilderberg Group, a secretive, invitation-only annual conference co-founded by her father which first met in Hotel de Bilderberg in Oosterbeek. Princess Beatrix married Claus von Amsberg on 10 March 1966 in civil and religious ceremonies. The bride wore a traditional gown with train in duchesse silk satin, designed by Caroline Bergé-Farwick of Maison Linette, in Den Bosch, and the Württemberg Ornate Pearl Tiara. The senior bridesmaids were the bride’s youngest sister, Princess Christina of the Netherlands; Princess Christina of Sweden, Lady Elisabeth Anson, Joanna Roëll, Eugénie Loudon and the bridegroom’s sister, Christina von Amsberg. The junior bridesmaids were Daphne Stewart-Clark and Carolijn Alting von Geusau, with page boys Joachim Jencquel and Markus von Oeynhausen-Sierstorpff. 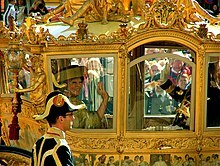 The royal couple travelled to the ceremony together in the gold state carriage. The civil ceremony was conducted by the Mayor of Amsterdam, Gijsbert van Hall, at Amsterdam City Hall. The marriage blessing took place in the Westerkerk, conducted by Rev. Hendrik Jan Kater, with a sermon by Rev. Johannes Hendrik Sillevis Smitt. Throughout much of her reign Beatrix had a considerable role in the cabinet formation process; notably she appointed the informateur, the person who leads the negotiations that ultimately lead to the formation of a government. However, this was changed in 2012, and now the largest party in the States General appoints a "scout" who then appoints an informateur. On 8 February 2005, Queen Beatrix received a rare honorary doctorate from Leiden University, an honour the Queen does not usually accept. In her acceptance speech she reflected on the monarchy and her own 25 years as Queen. The speech was broadcast live. On 31 May 2006 the 6th Polish Air Assault Brigade would receive the Militaire Willemsorde der 4e klasse in The Hague. Queen Beatrix was to tie the prestigious medal to the standard of the incumbents of the 1st Independent Polish Parachute Brigade. On 30 April 2009, the Queen and other members of the royal family were targeted in a car attack by a man named Karst Tates. Tates crashed his car into a parade in Apeldoorn, narrowly missing a bus carrying the Queen. Five people were killed instantly and two victims and the assailant Tates died later. Other victims of the crash were critically hurt. One week after the attack, another victim succumbed to the injuries he had sustained. The royal party were unharmed, but the Queen and members of her family saw the crash at close range. Within hours, Queen Beatrix made a rare televised address to express her shock and condolences. The man reportedly told police he was deliberately targeting the royal family. 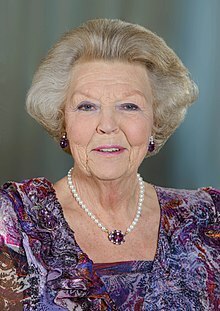 In a broadcast on national media on 28 January 2013, Beatrix announced her intention to abdicate on 30 April (Queen's Day), when she would have been on the throne for exactly 33 years. Beatrix stated that it was time to "place the responsibility for the country in the hands of a new generation." Her heir apparent was her eldest son, Prince Willem-Alexander. She was the third successive Dutch monarch to abdicate, following her grandmother and her mother. The broadcast was followed by a statement from Prime Minister Mark Rutte who paid tribute to Beatrix, saying "Since her investiture in 1980, she has applied herself heart and soul to Dutch society." The official programme for the abdication and inauguration took place on 30 April 2013. Beatrix signed the instrument of abdication in the Vroedschapkamer (also known as Mozeszaal) in the Royal Palace, Amsterdam at 10:07 a.m. local time. With the completion of her signature, she was no longer monarch. The inauguration of Willem-Alexander as king took place that afternoon in the Nieuwe Kerk in Amsterdam. In 2009, Forbes estimated her wealth at US$300 million. Princess Beatrix continues to undertake some royal duties and is patron of many organisations. She now lives in the small moated Drakensteyn Castle near the village of Lage Vuursche. Streekziekenhuis Koningin Beatrix, regional hospital in Beatrixpark, Winterswijk. Reina Beatrix School in Aruba. Queen Beatrix Hospital Medical Center, Sint Eustatius. It has been speculated that Queen Beatrix is De Onbekende Beeldhouwer (Unknown Sculptor), whose work has been appearing in Amsterdam since 1983. There has been no confirmation of this. Princess Beatrix has held titles throughout her life, as a granddaughter or daughter of a monarch, and eventually as the Sovereign. Queen Beatrix's official title was Her Majesty the Queen of the Netherlands, Princess of Orange-Nassau, etc., etc., etc. The triple etc. refers to the monarch's many dormant titles. She signed official documents with only "Beatrix". In common parlance she was referred to as The Queen (de koningin or de vorstin) or Her Majesty (Hare Majesteit). But when in conversation with the queen the practice was to initially address her as "Your Majesty" or in Dutch as "Uwe Majesteit" and thereafter as "Mevrouw" (ma'am). From birth till her inauguration as queen she had the following name and titles, to which she reverted after her abdication: Her Royal Highness Princess Beatrix of the Netherlands, Princess of Orange-Nassau, Princess of Lippe-Biesterfeld. ^ de Jong, Perro (30 April 2013). "The Netherlands' love and respect for Beatrix". BBC. Retrieved 5 June 2015. ^ Myrtille van Bommel, "Beatrix oldest Dutch reigning monarch Archived 3 November 2013 at the Wayback Machine", Radio Netherlands Worldwide, 2011. Retrieved on 2012-05-15. ^ a b c d e Youth Archived 5 May 2009 at the Wayback Machine. The Dutch Royal House. Retrieved on 2008-07-11. ^ (in Dutch) Geschiedenis, Grote Kerk Den Haag. Retrieved on 2012-05-15. ^ "CBC News". Cbc.ca. 18 January 2008. Retrieved 2010-03-05. ^ Education Archived 5 May 2009 at the Wayback Machine. The Dutch Royal House. Retrieved on 2008-07-11. ^ Davison, Janet. "Abdicating Dutch queen was a wartime Ottawa schoolgirl". CBC.ca. Canadian Broadcasting Corporation. Retrieved 29 April 2013. ^ "National Capital Commission". Canadascapital.gc.ca. Archived from the original on 13 October 2009. Retrieved 2010-03-05. ^ a b c "Het Koninklijk Huis". Koninklijkhuis.nl. Archived from the original on 25 February 2010. Retrieved 5 March 2010. ^ "Princess Beatrix Bridesmaid At Wedding". British Pathe. ^ "e_CV_Reine_Beatrix". www.coe.int. Retrieved 2017-01-20. ^ "Video: Wedding of Princess Beatrix and Claus von Amsberg". YouTube. ^ "Royal wedding Beatrix and Claus". ^ "Wedding of Princess Beatrix and Claus von Amsberg". Amsterdam Palace. Archived from the original on 17 April 2016. ^ "Queen Beatrix: marriage and family". Dutch Royal House. Archived from the original on 26 June 2012. ^ "Chapter 8. The process of Polish rehabilitation in 2006". Polish forces in the West. Archived from the original on 5 January 2019. Retrieved 10 January 2016. ^ NO. "Koninklijke familie was doelwit (Royal family was the target) (Dutch)". Archived from the original on 3 May 2009. Retrieved 1 May 2009. ^ a b "Dutch Queen to abdicate in April for son". Al Jazeera. 28 January 2013. Retrieved 28 January 2013. ^ a b "Queen Beatrix of the Netherlands to abdicate for son". BBC. 28 January 2013. Retrieved 28 January 2013. ^ "Time and place of abdication and investiture, 28 January 2013". Royal Dutch House. ^ "In Pictures: The World's Richest Royals". www.forbes.com. Forbes.com. 30 August 2007. Retrieved 2010-03-05. ^ (Dutch) Verhuizing Prinses Beatrix, Koninklijk Huis. Retrieved 24 July 2013. ^ Depictions, text in Dutch Retrieved 23 June 2017. 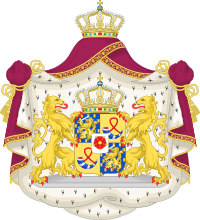 ^ "The Dutch Royal House; FAQ; "How should I address members of the Royal House?"". Archived from the original on 10 June 2007. Retrieved 2008-06-29. ^ Van den Bor, Conny (29 April 2010). "Queen Beatrix – still impeccable after 30 years". Radio Netherlands Worldwide. Archived from the original on 11 November 2013. Retrieved 28 January 2013. ^ "Prins van Oranje wordt Koning Willem-Alexander" (in Dutch). Website of the Royal House. 28 January 2013. Retrieved 28 January 2013. Wikimedia Commons has media related to Beatrix of the Netherlands.